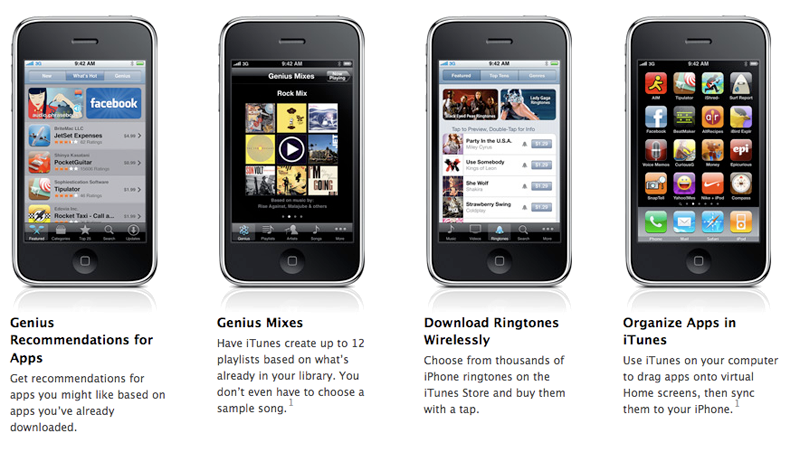 The update, iPhone OS 3.1, is available today as a free download from iTunes. For iPhone users, the version number is 3.1, while for iPod touch users it is labeled 3.1.1. The new Genius feature will recommend new applications to users based on software they already have installed. In July, Apple Chief Executive Tim Cook said that the company was working on a fix for the App Store to make it easier to find new content. With tens of thousands of offerings available, it has become difficult for some to find what they are looking for. The new software update also adds ringtones from record labels, directly into the iTunes application on the phone. The update is also available for iPod touch users. Those who have paid to upgrade to 3.0 will receive the 3.1 update for free. For those who have an iPod touch but have not yet upgraded to 3.0, Apple also reduced the price to $4.95. Apple also announced Wednesday that the company has sold 20 million iPod touches, and there are more than 75,000 applications available for download in the App Store. To date, more than 1.8 billion applications have been downloaded on the iPhone and iPod touch.